Letters for Science is a participatory project that invites the public to write letters defending science and address them to science denialists. 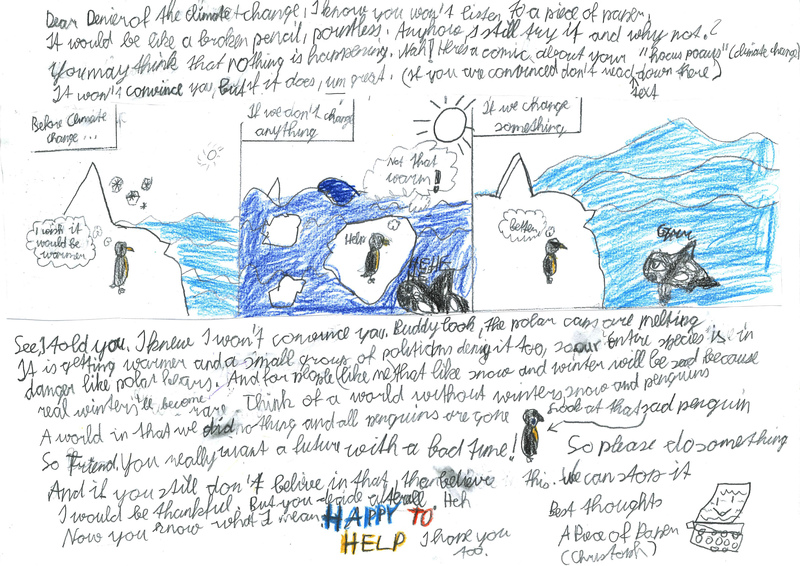 Shown here are some examples by 13-year-old students from Eferding who are learning English who have chosen to write to climate change deniers. The goal of this project is to create a respectful and concrete bridge between the filter bubbles that populate science-related topics such as climate change, vaccinations, the shape of the earth, etc., and to humanize our stories with nature. Why does it matter to you if people think climate change is not real, for example? How might you try to convince a climate change denier otherwise? How can you be persuasive without being patronizing? „Letters for Science (Briefe für die Wissenschaft)“ ist ein partizipatorisches Projekt, das das Publikum dazu einlädt, Briefe zur Verteidigung der Wissenschaft zu schreiben und sie an Wissenschaftsverweigerer zu adressieren. Hier werden einige Beispiele von 13-jährigen Schülerinnen und Schülern aus Eferding gezeigt, die gerade Englisch lernen und sich entschieden haben, an Klimawandelleugner zu schreiben.